The printable journal files on this page have titles in the header of the pages. They are sorted below and most have an accompanying image. A couple of the journals are available in doc and rtf and you may change the title to suit you in those. See also the Related Links on the right. This journal is from the Garamond collection and is also linked in High School Planner. The journal has am empty square at the upper right hand side. That empty square can be used for a picture, drawing, quote, etc. I have included the doc and rtf files. With those files, the header and other parts of the journal form may be altered. A simple ruled journal, pure simplicity that happens to match the rest of the planner. Incidentally, the font used in the Portfolio set is the same as the font used in the Garamond planner set. 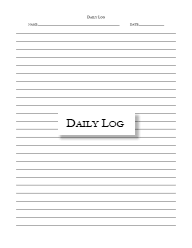 This daily log from the papyrus planner is just like the daily log from the portfolio planner except for the font face used. 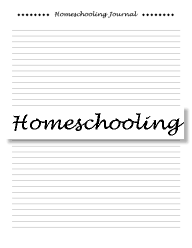 Homeschooling Journal is from the small but pretty Marble collection. I made the marble collection many years ago. It was one of my more creative planner styles. This journal if very old, it's one of my first journal forms. It matches no other planner files at donnayoung.org.